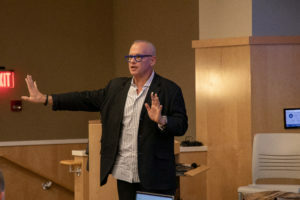 Laurence Hobgood, acclaimed jazz pianist, and Robert Pinsky, the only three-time United States poet laureate, came to campus as part of the Gerhold Lecture Series in the Humanities Tuesday to perform selections from their PoemJazz project. PoemJazz is best described as a conversation between music and spoken word, where poetry is spoken alongside improvised jazz music. PoemJazz was released in 2012, and the sequel, House Hour: Poem Jazz II, was released in 2015. Pinsky explained that he and Hobgood met through producer and entrepreneur Richard Connelly. One of Connelly and Hobgood’s clients, jazz singer/songwriter Kurt Elling, was using one of Pinsky’s poems in his stage performance. Pinsky went to a performance at Regattabar in Boston, where the pair met. “I think a couple of weeks later [Conelly] had the two of us in his studio [making PoemJazz,]” Pinsky said. According to Pinsky and Hobgood, the final product of PoemJazz is their combined efforts at improvisation. “What we do in the studio is totally improvised … we play in the studio just like we’re playing live; we’re making stuff up,” Hobgood said. 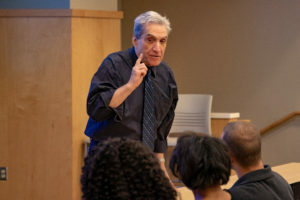 Pinsky said his role in improvisation depends a lot on how the words of the poem are spoken. During the making of the first record, Hobgood said he asked Pinsky for thematic direction when creating the music. “When we were first working together, there was an extent to which I wanted to make sure that a thematic direction I was going in made sense to Robert for that poem … Is it bluesy? Is it hyper? Is it sad?” Hobgood said. By the time they made the second record in 2015, Pinsky said things were much different between them. 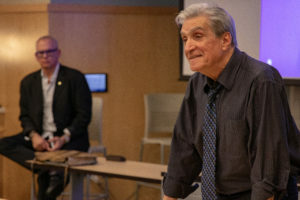 “By the time we cut the second record, we had performed together quite a lot, and there was more musical confidence and confidence as an ensemble,” Pinsky said. This mutual confidence had a positive effect on the outcome of the record according to Pinsky. “PoemJazz is maybe a bit more of a miscellany, and House Hour is more in one mode or mood, but I don’t know how to name,” Pinsky said. 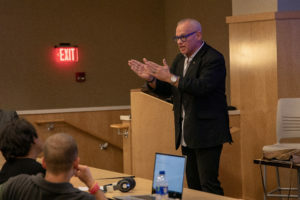 Students were invited to ask Hobgood and Pinsky questions during a Q&A at 3 p.m. Tuesday, and the pair performed some of their pieces for students and community members during a concert at 7:30 p.m. in Mees Hall. 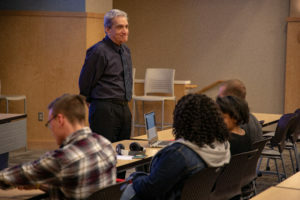 This event was part of the yearly Gerhold Lecture Series in the Humanities and part of the celebration of 100 years of music at the university. We also talked about upcoming projects and the possibility of another PoemJazz release. The interview was broadcast live on WXCU, and a full version of the interview will be available on their website, WXCUradio.com, Friday.